The first Nissan Leaf, launched in 2010, was very successful and helped bring electric cars to the masses. An all-new version was launched in 2018 and that same year it became Europe’s best-selling, pure-electric vehicle. However, the competition is growing, so the Leaf has its work cut out maintaining its lead. Just like the last one, the current Leaf is similar in size to the Volkswagen Golf, Ford Focus, and Vauxhall Astra. Its main electric rivals are the Renault Zoe, Hyundai Ioniq EV and Kona Electric, Kia e-Niro and the Volkswagen e-Golf. The standard Leaf has a 40kW battery powering a 150hp electric motor. It can travel up to 128 miles on a full charge but some newer rivals can beat that. It’s why, in March 2019, Nissan added a second, more powerful Leaf with a longer range, to the model line-up. Called the Leaf e+ and available only in top-spec Tekna trim, it has a battery rated at 62kW. It powers a 217hp electric motor to give stronger performance and a range, claims Nissan, of 239 miles. Looks-wise, electric cars can divide opinion. In losing its predecessor’s high-rising front lights, that made it look like a surprised frog, the current Leaf looks a lot more mature than before, although still distinctive. In comparison, the Hyundai Ioniq and Volkswagen e-Golf look more conventional, which some buyers will find more appealing. Being an electric car, the Leaf’s power arrives almost instantly, so most drivers should find the standard 40kW version is fast enough from 0-30mph. The steering is light around town, which really suits the character of the car. The Leaf doesn’t have a clutch or gears. For this reason, the transmission lever is actually a small ball that you slide into drive, reverse and neutral. The Leaf is almost silent inside but it does emit a light buzz from outside to alert pedestrians to its presence. Because the batteries are heavy, and mounted low in the car, the Leaf’s suspension needs to be stiffer than a normal car’s to cope. This means the car crashes and judders over bumps, and it isn’t quite as comfortable as a Vauxhall Astra on long journeys. Inside, there are some scratchy and flimsy plastics that you wouldn’t find in a Volkswagen e-Golf. All versions have Apple CarPlay and Android Auto, which allows mirroring of your phone on the car’s entertainment screen. This system and the Nissan Connect smartphone app were upgraded in March 2019. Top-spec Tekna models have leather, which helps lift an otherwise fairly dull interior. Rear space is impressive. There’s enough room for tall adults, even if the driver is also tall and has their seat pushed back. Boot space is an impressive 435 litres. To put that into context, the petrol/diesel burning Volkswagen Golf and Ford Focus only have 380 litres and 341 litres respectively. It has a bit of a lip, though, and the Bose sound system gets in the way (on Tekna models) but it’s still big. Regarding economy, in the case of electric cars it’s a case of balancing cost with range. The more you pay, the farther you go, and vice versa. If you tend to do only short journeys and can top-up the battery at home, the cheapest Leaf, the Acenta 40kW is the most economical or cost-effective version. N-Connecta level brings a raft of assistance features that will help with family life. They include parking sensors and moving object detection, as well as the helpful Intelligent Around View Monitor, which essentially gives you a bird’s eye view of the car. It also had a rapid-charge port for greater convenience. The e+ Tekna is the only version of the Leaf with the more powerful 62kW battery and 217hp electric motor. It can take the car from 0-62mph in just 7.3 seconds but has a range, claims Nissan, of up to 239 miles. 2017: Nissan calls time on the first-generation Nissan Leaf. 2018: New Nissan Leaf on sale in UK. e-Pedal, longer range, and updated design separate it from the old one. 2019: The Leaf E+ Tekna joins the range offering more power and a greater range. Was previously a special edition. There are four trim levels on the Leaf. Tekna is the most expensive, and has the most amount of toys. There is only one motor option, and no gearbox for the Leaf. So the only thing you have to pick is trim level. Generally there’s no reference to the power of the battery or electric motor except in the case of the most powerful Leaf, called the e+. As of March 2019, there are two engines, or motors, to choose from. The lowest powered produces 150hp and uses a 40kW battery. It has roughly the same power as an equivalent Ford Focus or Vauxhall Astra, but it’s much quicker. It'll do 0-62mph in 7.9 seconds, whereas a 1.5-litre diesel Ford Focus will take 10.2 seconds. On the other hand, it can only travel up to 128 miles on a single charge. What’s more, you can’t quickly extend its range by rapid-charging the battery more than once on a single journey. Nissan says that this is to ‘safeguard’ the battery, in order to maintain battery life over an extended time period. While this won’t affect the range, it is something to bear in mind if you regularly travel long distances. Fast chargers will generally let you charge from empty to 80 per cent in around 40 minutes. On the trickle charge, it might take you more like two hours. The most powerful Leaf is called the Leaf e+. It’s powered by a larger 62kW battery and its motor produces 217hp. As a result, it can accelerate from 0-62mph in just 7.3 seconds, faster than most petrol cars of its size that aren't hot hatchbacks. Nissan claims the car can travel for up to 239 miles on a single charge. This number will fall in real-world use but means the car should be competitive against rival electric models. The Nissan Leaf is available in three trim levels. All versions have the e-Pedal that accelerates the car when pressed and decelerates it when released, a host of electronic safety systems including ABS and hill start assist, and parking sensors. Alloy wheels are standard too, although they’re smaller 16-inch wheels on entry-level Acenta trim. Acenta also has front fog lamps and electric folding door mirrors. Apple CarPlay and Android Auto, a sat nav and a rear view monitor. N Connecta adds 17-inch wheels, privacy glass, moving object detection, and LED lights with self-levelling capabilities. It also has heated seats and a heated steering wheel. Top spec Tekna cars get a powerful Bose sound system and ProPilot parking assistance that can parallel and bay park the car for you. The e+, the most powerful Leaf, is only available in Tekna trim. The Leaf hasn't appeared in Auto Express' Driver Power customer surveys yet. However, its predecessor, ranked just outside the top 30 in 2017, a performance it repeated in 2018 when it charted at 38 out of 75 cars. The Leaf has a 60,000 mile/three-year warranty as standard. It also comes with a five-year/60,000-mile warranty on all electric vehicle-related components. There’s also an eight-year/100,000 miles battery warranty that covers capacity loss of more than nine of its 12 bars (as shown on the capacity gauge on the dashboard). 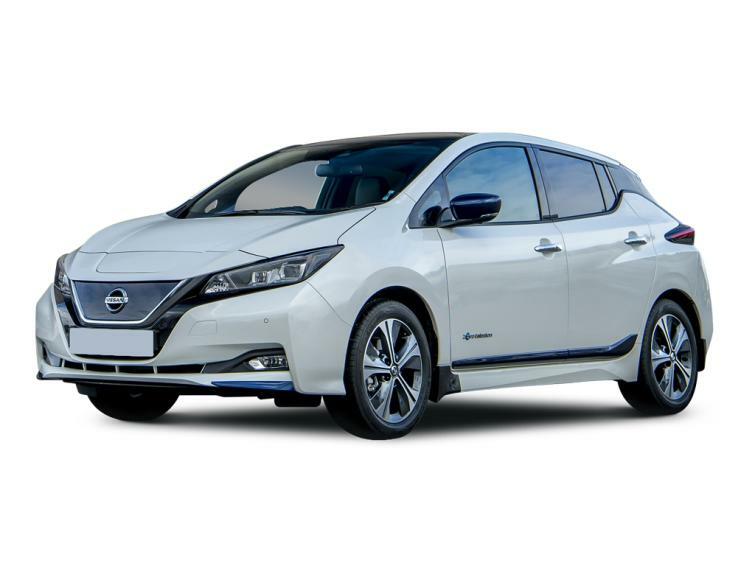 There are currently 30 Nissan Leafs available on BuyaCar, with prices ranging from £14,950 to £32,000 for nearly-new models. More expensive and better specced cars lose more money than lower specification cars. This means that the biggest savings can be found on top-spec Tekna models. All of these cars will also still have manufacturers' warranty left too. Tekna models, with ProPilot assistance and a Bose sound system, start at £25,980 and £403 per month on BuyaCar. Until early 2019, there was a trim level called Visia. It was the most basic, though, if you're just after a cheap electric car, they can make a canny used bargain. On the outside, the new Nissan Leaf is more-grown up looking than the (admittedly smaller) Renault Zoe, although not quite as normal looking as the Hyundai Ioniq or Volkswagen e-Golf. The 150hp electric motor is powered by a 40kWh battery. It’s super fast from 0-30mph because the power is instant, and there’s no waiting round for the car to build momentum. Because the batteries are heavy, and mounted low in the car, the suspension needs to be stiffer than a normal car to cope. This means that the car can crash and judder over bumps, and it isn’t quite as comfortable as a Vauxhall Astra on long journeys. Range is the big question in this car. In the real world it’ll achieve between 130 and 200 miles depending on how you use it. Inside, there are some scratchy and flimsy plastics that you wouldn’t find in a Volkswagen e-Golf, but they would feel at home in a Renault Zoe. The media screen feels a bit outdated using just Nissan’s systems. However, most models have Apple CarPlay and AndroidAuto, which allows mirroring of your phone on the screen. Rear space is impressive - there’s enough room for tall adults even if the driver is tall. Boot space is an impressive 435 litres. To put that into context, the fossil burning Volkswagen Golf and Ford Focus only have 380 litres and 318 litre respectively. It has a bit of a lip, and the Bose sound system gets in the way (on Tekna models) but it’s still big.